The centre diamonds are the same 3" size as the Seminole-pieced diamonds, and the outer diamond is the full 6" width of the border. 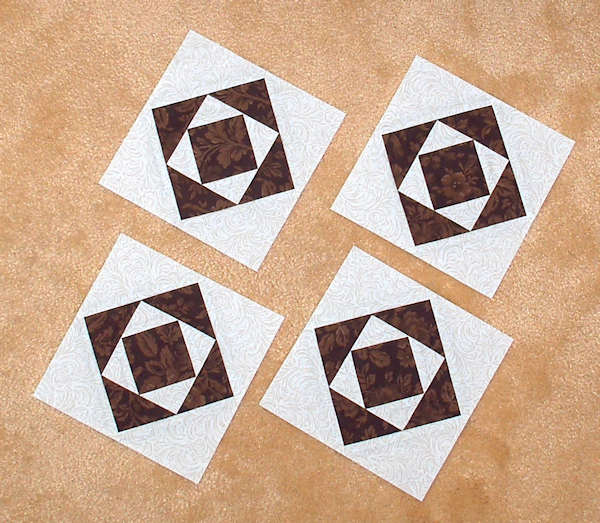 I made my own foundation paper piecing templates for these blocks. 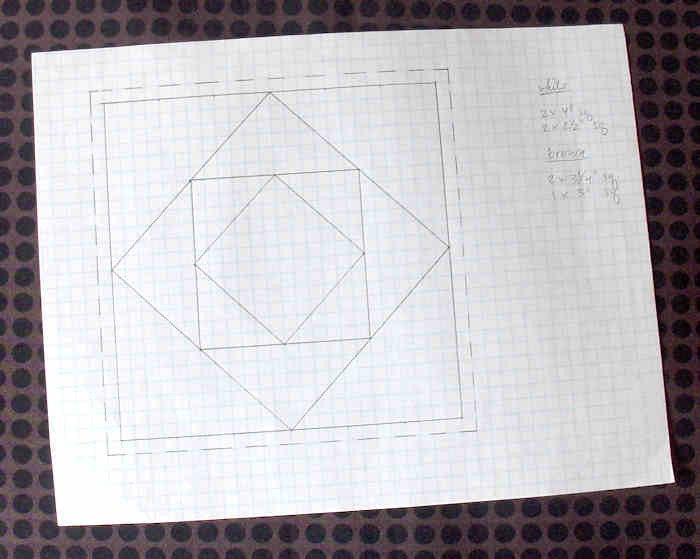 With 1/4" graph paper you don't even have to measure! Just count out 4 squares to the inch. I mark dots in all the corners, and then use a ruler to connect the dots. Easy! Then I put my original in the copier, set the quality to draft, and run off as many as I like. The graph lines don't copy, just the darker pencil lines, so you get a very clean template. Old copiers used to distort the image slightly, so check your copies to make sure they are still exactly to scale. My Canon All-In-One prints them off perfectly. I am also still using the Simple Foundations Translucent Vellum Paper, which is so convenient! When I'm paper piecing triangles like this I start with oversized triangles rather than strips. This saves fabric, and it also keeps everything on the grain. The vellum paper makes it easy to be sure the triangles are in the right place before I sew them down. Vellum is a little more expensive, but because so many of my paper piecing plans involve half square triangles like this, I will probably keep using it. Hopefully it will not be much longer before I get this top finished. I am sooo close! You make it look easy. Maybe one day I'll give it a go. I'm looking forward to seeing the result. It's a great concept. Thanks, Jillian! We're in our first official heat wave of the summer, so I haven't turned on the sewing machine for a few days. But the weather should break this weekend, and I'll finally get this top done then! You can find free graph paper in many sizes and shapes on the internet - which you can print for free. Also templates for hexagons for EPP. I print them out on light weight card stock. Can't wait to see the finished quilt top!